MSI’s new Arterra Porcelain Pavers bring the look of natural stone and wood into the exterior paver market. High definition glazed ink jet pavers offer all of the features of natural stone pavers, with the added benefits of porcelain. 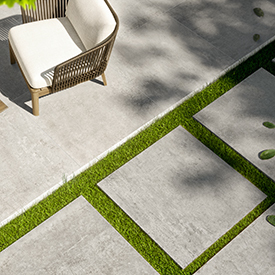 With all of the same characteristics and installation techniques of natural stone, these Arterra Porcelain Pavers can also withstand freeze-thaw cycles. They can set on grass, sand set or be installed with mortar over a concrete bed.